Since taking office, President Donald Trump has made no bones about his commitment to the fossil fuel industry. Approximately two months after his inauguration, Trump signed an executive order exhorting the nation to develop its domestic energy resources, while minimizing regulatory burdens. Then, that June, Trump announced plans to withdraw the U.S. from the United Nations’ Paris climate agreement, which he said threatened jobs in industries such as coal mining. Now, details of the Interior Department’s draft five-year offshore drilling plan have lawmakers on both sides of the aisle concerned. Much of the nation’s coastline previously had been closed to drilling, but this new draft plan, released in January, opens more than 98 percent of coastal waters to leasing, including all of California’s, Oregon’s and Washington’s and most of Alaska’s. State and federal officials from both parties – such as Alaska Republican Sen. Lisa Murkowski, California Attorney General Xavier Becerra and Washington Governor Democrat Jay Inslee – have asked Interior to reconsider. Concerns expressed range from worries about what oil spills would do to coastal communities, to a desire to wean their economies from fossil-fuel industries. 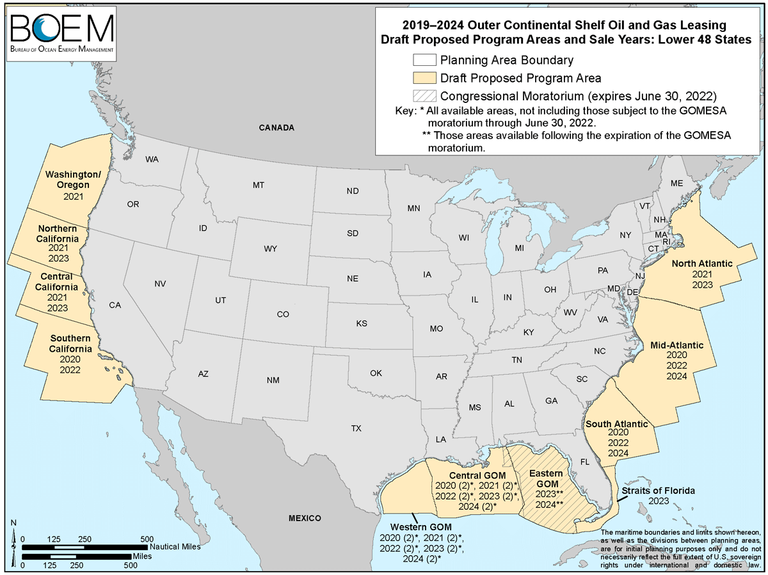 The proposed areas for new oil and gas leasing in the Lower 48 through 2024. Click to view larger. 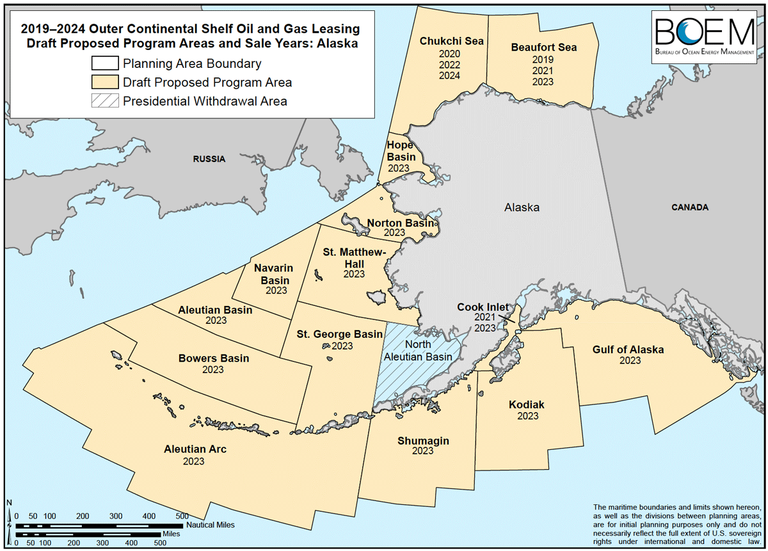 The proposed areas for oil and gas leasing from 2019 through 2024 in Alaska. Click to view larger. The continental shelf regions of Alaska and the West hold some 37 billion barrels of oil and 147 trillion cubic feet of natural gas, according to the Bureau of Ocean and Energy Management. Interior Secretary Ryan Zinke’s proposed drilling program replaces his predecessor Sally Jewell’s plan three years before it would have expired. A new administration has only tossed a previous administration’s offshore leasing plan prematurely once before in the past three decades, under Ronald Reagan in the early 1980s. In multiple letters to Zinke, California Gov. Democract Jerry Brown, Oregon Gov. Democrat Kate Brown and Washington Gov. Democrat Jay Inslee have pointed to their states’ economic dependence on clean coastal waters for everything from billion-dollar shellfish and fishing industries, to tourism, recreation and “scenic and spiritual bounty.” They have urged the Trump administration to reduce the country’s carbon pollution and take a leadership role in fighting climate change. “Instead of opting to drill for new oil along our coast, we encourage the federal government to pursue energy policies that embrace clean energy and the reduction of greenhouse gas emissions,” they wrote in one letter. Adding to lawmakers’ frustration was a tweet by Zinke on Jan. 9, stating that after meeting with Florida Gov. Republican Rick Scott, he’d agreed to exempt that state’s coastal waters from offshore drilling, raising questions of due process and political influence. The Trump administration has since made conflicting statements about whether or not Florida’s offshore waters would remain protected. The attorneys general of California, Oregon and Washington also wrote to Secretary Zinke, describing concerns about potential impacts of offshore oil and gas drilling and expressing concerns about the legality of the department’s process in developing the program. 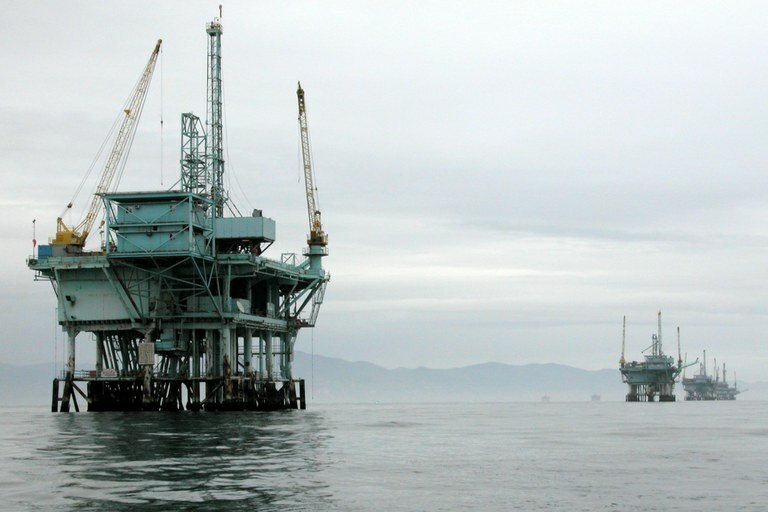 Offshore oil rigs near Santa Barbara, California. Murkowski, Alaska Rep. Republican Don Young, and Alaska Sen. Republican Dan Sullivan sent a letter to Zinke after the now-infamous tweet, also asking him to reconsider. Though they praised the new offshore drilling plan, they concluded by asking that almost all of the waters around Alaska be closed again, allowing less leasing in only three areas, although they did not offer any reasons. President Barack Obama had closed two — the Beaufort and Chukchi seas — to oil exploration in 2016, citing their importance to Arctic wildlife and the Alaska Native communities they supported. Obama also made Alaska’s Bristol Bay off-limits to drilling in 2014 to protect its tourism economy, commercial fisheries and importance to Alaska Native communities. But under the new plan, Bristol Bay is the only Alaskan region still protected. And Western states are fighting back another way: In February, the California State Lands Commission informed the Bureau of Ocean Energy Management that the state opposes offshore drilling, that the “fossil fuels era is ending,” and that, perhaps more to the point, California will refuse to allow pipelines to be built for transporting oil or gas from new leases onto its coast. The draft offshore leasing program is open for public comment through March 9. Several more steps remain before the plan is finalized, after which lease sales will begin. Different regions will open for bidding according to the agency’s calendar. Alaska’s Beaufort Sea opens in 2019, while southern California opens in 2020.